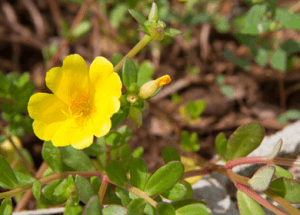 Purslane: Frustrating Weed or Melatonin Powerhouse? Purslane has the greatest amount of omega-3 fatty acids of all edible plants. Researchers at the University of Texas are quick to point out that this remarkable herb also contains more than 20 times the melatonin found in any other fruit or vegetable. Melatonin is a powerful antioxidant that is thought to protect from cancer. This mighty herb is also an excellent source of vitamin A, which is essential for optimal vision. Vitamin A also helps to keep the mucus membranes of the skin healthy and may protect against lung and oral cavity cancers. Purslane plants are a rich source of vitamin C and some B-complex vitamins including magnesium, calcium, iron, potassium, and manganese. Tiny inconspicuous flowers with yellow petals arrive in mid-summer and last until fall. Small fruit capsules contain even smaller black seeds. Both the crisp leaves and the stems make an appealing addition to salads or can be eaten as a raw snack. You can even add some purslane to your breakfast smoothie for a powerful nutritional punch. If you don’t want to grow your own, you can usually find purslane at farmers markets or whole food stores. If you have a desire for a contained crop of purslane, you can grow it just about anywhere. Start seeds in small nursery pots. Transfer to a sunny spot in your garden when the plants are about three inches long. Keep the soil moist and the purslane will take over. It is both heat and drought tolerant, so once it is established it requires little care. Note: If you are picking wild purslane be extremely careful of poisonous spurge – it looks similar to purslane but produces a milky sap when it is broken. The stem of spurge is also wiry and not thick like purslane. Hey Buddy!, I found this information for you: "Purslane: Frustrating Weed or Melatonin Powerhouse?". Here is the website link: https://www.thealternativedaily.com/purslane-frustrating-weed-or-melatonin-powerhouse/. Thank you.